Every month, landscape designer Darbi Davis digs deep to bring you stories for your outdoor space. 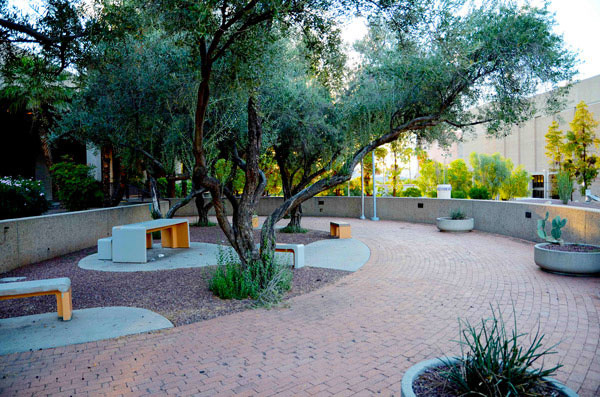 Here, she reveals some mid-century landscaping treasures in the heart of Tucson’s downtown. 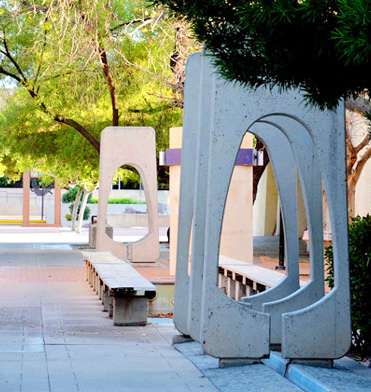 As Tucson’s mid mod fans gather for the second annual Modernism Week, they might want to take a little stroll downtown. There, spanning over five acres, lays a mid-century surprise: a rare and exquisite example of classic mid-century landscape design known as the Tucson Community Center Landscape. 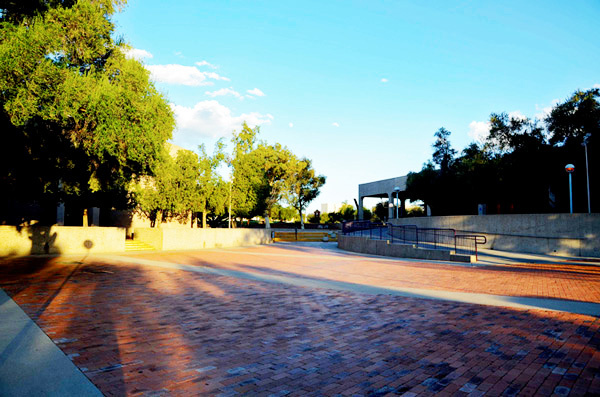 The space, located south of Broadway, connects several new and old structures around the Tucson Convention Center. 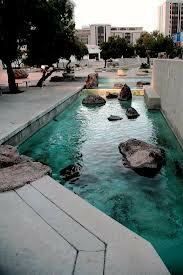 It is the work of Garrett Eckbo, a founding father of classic mid-century landscape design. The age of Modernism as it defines Landscape Design was a decade where science and technology reigned, mass-produced materials ruled, and America was seeking an identity within a Modern world laced with radical art, architecture, literature and theory. 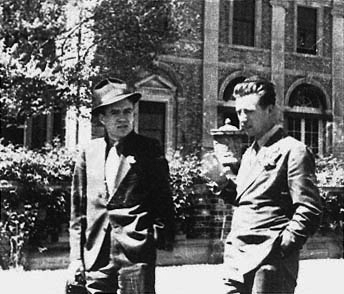 Thanks to Garrett Eckbo, James Rose, and Dan Kiley, the Classic Modernist Landscape was born. These irreverent lads all went to Harvard Graduate School of Design. Most graduated. One was expelled. Literature was their primary weapon against the system, and writings with headings such as “How to Prevent a Garden,” and “Landscapes for Living” surfaced. Who knew landscapes and gardens were not for living prior to Modernism? Indeed, they were reserved for the elite and rarely, if ever, considered the social lives of humans. 1. The Space The landscape was sculpted as a form of social art, and designed to serve as a gathering place for the people. General design characteristics of modern landscapes include a tight connection between indoors and out, ecological elegance, spatial sensibility, authentic materials – and, most importantly, people. Yes, these spaces were designed for you. 2. The Materials Materials were the finished product. Can you imagine the delight in not having to choose a paint color with your partner? Well that’s the reality of a mid-century design – no need to paint or stucco that wall, the concrete is the finish. Simply genius. 3. The Plants The vegetation consisted of drought-tolerant choices, and was placed in groves or allees to provide shade and respite from our hot climate. Sound familiar? These guys were xeriscaping way before their time. 4. The Fountains There were fountains and boulders, and for Tucsonans whose summer season lasts a full six months and into triple digits, that’s a lot to love. 5. The Buildings All of the buildings surrounding this space had cultural significance (then and now), bringing together the Convention Center, theater, hotel, and adjacent open spaces. So the next time you find yourself at Cinema La Placita, the Leo Rich Theater, or on jury duty, take a walk through this historical landscape, wander through the spaces, and recall that you are walking among a rare bit of history. * For more mid century Tucson spaces, don’t miss the Tucson Modernism Week Home Tour on October 6th. For the first time, TMW is collaborating with Architecture Week for a tour that combines historic and contemporary. Details and tickets here.